When you get the sniffles your mom may have poured you a glass of orange juice. If you have a big event coming up and you begin to feel a tickle in the back of your throat, you may have downed the orange juice! Since it appears to be such a super drink, should we give some to our pets? It can be tempting if we suspect our pet may have a cold or we simply want to give them the best nutrition, but what should we be considering when it comes to giving our pups some citrus? Can you give your dog orange juice? Answer: Yes, but they shouldn’t. To begin with, your dog has different nutritional requirements so the need for Vitamin C supplements, or any other nutrients in orange juice, they can require from their dog food. For a dog, sipping orange juice for nutritional value is just not necessary. When it comes to hydration, your dog will get all they need from water. There really are no benefits from giving your dog some orange juice. Unfortunately, there could be some consequences. If you dog accidentally drinks a bit of OJ you may have nothing to worry about. The citric acid may upset their stomach, but it is not likely. It is prolonged drinking that could actually cause some harmful consequences. The acidity and sugar can destroy the tooth enamel. Also, the high amounts of sugar and additives are more likely to cause other health issues for your pet. With no benefits and a few possible consequences, there is no reason to give your dog orange juice. There is also no reason to grow concerned if they help you clean up a bit of spilled orange juice. A stomach ache is most you will need to be worried about. 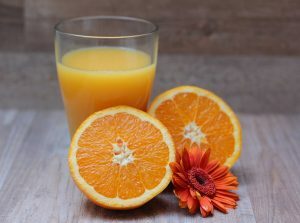 Orange juice is beneficial for us, but there are no benefits for your dog. It does not matter how much orange juice you give your dog, it will not help boost their immune system or help wake them up in the morning. It could help when they are thirsty, but water will provide plenty of hydration, while also being more beneficial. If you are still considering giving your furry friend some orange juice, what you should be thinking about is the consequences. Most orange juices sold at the grocery store are packed with sugar, preservatives, and additives. Read the nutritional information on the back of a box. You will find several other ingredients besides oranges and sugar. The combination of sugar and citric acid is a horrible combination for dog’s teeth. Consuming too much can certainly harm their enamel. The result is allowing your dog to be vulnerable to tooth decay. This damage is also not reversible. Due to the citrus from the oranges there are also high levels of citric acid. Consuming too much could upset a dog’s stomach causing, vomiting, diarrhea, and chronic issues. 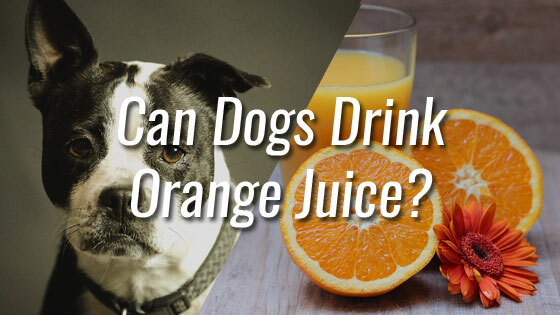 Even consuming a small amount of orange juice could make some dogs sick. Lastly, when your dog has a bowel movement it can cause a bit of burning as it leaves them. The overall experience of a dog consuming too much orange juice is going to be very unpleasant experience for your dear pet. If you are hoping to give your pet some orange juice as a treat, there are other options that can actually benefit your dogs health. Consider giving your best pal some raw carrots, sprouts, honeydew, cucumbers, or sweet potatoes! All of which can be beneficial to your pet. If you pet falls into the category of finding orange juice irresistible and you cannot help but give him just a bit because of those puppy eyes, allow a few sips in moderation. When you first begin giving your pet some, be sure to watch them for the first 24 hours to confirm no issues arise during digestion. If your dog were to lick up a bit of spilled orange juice, it is certainly nothing to worry about. If you are considering making it a habit, it is not suggested since there are no benefits for your pet. If your dog does happen to love orange juice and gets excited every time you break out that box, a treat every once in a while will not harm your pet. Can Rabbits Eat Cauliflower? Can Cats Eat Green Beans?